Among the most commonly used type of rivets is the oval head, semi-tubular rivet. 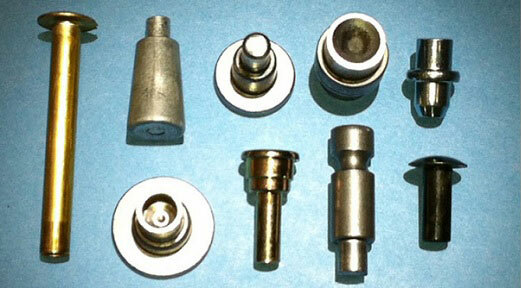 This type of rivet is appropriate for a wide range of applications. Oval head rivets are frequently used in the aircraft industry, but they may also be used in a variety of other types of applications, as well. If you are searching for oval head rivets, there are a few factors that must be considered. One of the most important factors to consider when choosing an oval head rivet is the desired length. A variety of factors must be taken into consideration in selecting the length for an oval head rivet. Riveted work-pieces are frequently joined together by compressing or impacting the tubular end of the fastener using a crimping die. The length of the rivet's shank must be sufficiently long in order for it to be able to pass through the workpiece while still leaving enough of the shank's length left to allow for the clinching process. This means that is imperative that you pay careful attention to the length of the oval head rivet that you select. If you choose a rivet that is not long enough, it will result in problems during the installation process. Additionally, it is important to understand that the tightness of the actual clinched joint will be based on the amount of force that is applied to the rivet's clenched end. In choosing the right type of oval head rivets, it may be necessary to work with a supplier who is able to provide custom produced rivets in order to ensure that you obtain the right length. This is why it is imperative that you take the time to research your options and find out as much as you can about a rivet supplier before you make a final decision. Another factor to consider is whether the supplier offers cold headed rivets. Cold headed oval head rivets often provide a number of important advantages that should be considered. Among those benefits are lower production costs and the ability to produce large minimums of rivets in a short production run.